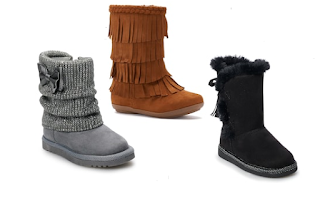 Kohls currently has Jumping Beans Boots for toddlers for just $19.99 (regularly $44.99). Choose from 7 different styles and up to 4 different colors. In addition, through October 17th, get $10 in Kohl’s Cash for every $50 you spend. Your Kohl’s Cash will then be redeemable from October 18 – October 28.